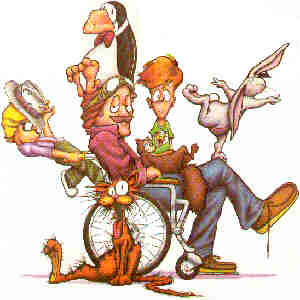 characters from that strip, Steve Dallas and Cutter John, were carried over into his first nationally-syndicated daily strip, Bloom County, which debuted on Dec. 8, 1980. From its first installment, Bloom County was accused of being an imitation of Garry Trudeau's Doonesbury — a charge that is not entirely without justification. It bears a certain resemblance to Trudeau's strip in both style and point of view, and Breathed (rhymes with "method") makes no secret of the fact that he is a great admirer of Trudeau's work. Furthermore, it was commissioned by The Washington Post Writers Group (the first comic strip handled by that company, which mostly syndicates political columnists, by the way) for the purpose of replacing Doonesbury, which had switched to a rival paper. But although Breathed was clearly influenced by Trudeau, he is no slavish imitator. His humor, while coming from a similar political outlook, is less overtly political than Trudeau's. Also, much of the humor comes from the strip's fantasy elements, including a large cast of talking animals. In fact, the most popular character in the strip was a penguin named Opus — whose plush toys were also the strip's biggest merchandising success. In its time, Bloom County made quite a splash. It appeared in over 1,000 papers, was reprinted in numerous books — some of which became best-sellers — and in 1987, won a Pulitzer Prize. But its time was brief. In 1989, Breathed, saying, "In most cases, comics age less gracefully than their creators," retired the strip. The last episode appeared on August 6 of that year. It was replaced by a new strip with a new setting and new characters, the Sunday-only Outland. Breathed repeated his earlier schtick of carrying over some characters — in fact, before long, he'd imported a large portion of the Bloom County cast. But Outland failed to find as large an audience. It was gone after a few years, and Breathed retired from comics. Lately, he's been writing and illustrating children's books, some of which star Opus. (One of them, A Wish for Wings that Work, was made into an animated Christmas special, which is the closest Bloom County ever came to appearing on TV.) The Penguin was back in comics 2003-08, as star of a Sunday-only newspaper feature titled Opus, but its reception was unenthusiastic. Perhaps Breathed is right about aging comic strips — but by cancelling Bloom County when he did, he has absolutely ensured the aging of his own strip. Unlike the other major modern features that were ended by their creators at the height of their popularity, Bill Watterson's Calvin & Hobbes and Gary Larson's The Far Side, Breathed's strip dealt with contemporary issues. Never having progressed into the 1990s and beyond, it remains, now and forever, a 1980s period piece. Text ©2000-09 Donald D. Markstein. Art © Washington Post Co.